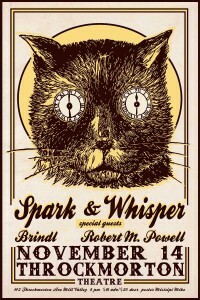 Opening for the amazing folk duo Spark and Whisper! I will be playing a shorter opening set for this wonderful night, not to be missed….. If you don’t know Spark And Whisper’s music, check them out below! Modern Folk Music from Northern California! Spark & Whisper will be with their full band– Scott Johnon on Drums, Robert Powell on Pedal Steel, Paul Eastburn on Bass, and some special guests. A little blast from the past – Grandma’s Song, as performed in 20+ Northern California venues and festivals… The basis of this video is a live recording made at the Throckmorton Theatre.